These days, there are 50% more stores in the UK that deal in used games than there were a scant year ago. Earlier today, we reported that the increased prevalence of programs like EA's Project Ten-Dollar wasn't hurting used game sales in the UK, claimed the country's most prominent videogame retail chain. 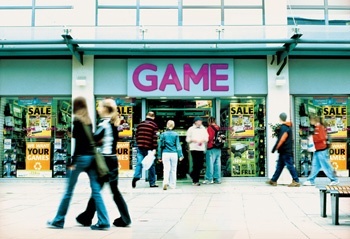 In fact, a study carried out by MCV UK suggests that used game retailers are more ubiquitous than ever. The study revealed that there were an estimated 3,000 outlets in the United Kingdom that dealt in used game sales. This is a huge increase from last year's study, which counted a comparatively paltry 2,000 outlets during the same. In other words, in just a year the UK has seen the number of stores involved in the used game trade increase by nearly half, which is staggering. Most of the increase can be attributed to non-specialty retailers throwing their hand in the mix. Supermarket chains Tesco and Asda have begun offering trade-in programs, as has general retailer Argos. GAME CEO Ian Shepherd doesn't particularly mind the competition, though. "Our pre-owned business goes from strength-to-strength - it's a strong and growing part of our mix," said Shepherd. "No one can be bold enough to claim such a thing as 100 per cent share. Is there room for others in the market? Yes, there probably is." It remains to be seen whether this increase in outlets offering used games will significantly affect the amount of used games traded in and sold, or if the amount will stay the same, just spread across new locations. Either way, the game publishers that have made the pre-owned trade such a contentious topic can't be happy with a surge of this magnitude.